Our Philosophy: A Traditional martial art needs to be taught within the framework of what has been taught in the past. In this way it will develop central concepts and ideals. Students will begin to see themselves as part of something larger and more important. Changing the curriculum to meet popular interest turns the art into a product. Goju Ryu is Deep not Wide, we have only 12 Kata. Some hear this as ‘we only have 12 Kata’ perhaps thinking this sounds easy (and boring). These 12 kata help develop and refine central guiding principles of Goju ryu and lay out a curriculum for a lifetime of study. This speaks to the genius of the founders and their understanding of combat and the human body as well as their ability to package and transmit information. As someone who has been practicing these 12 kata for most of my life I can tell you the true information is revealed after years of practice and study needs to be guided by someone who has gone down this path before. Our position: We are a karate school. Our instructors work to demonstrate good charter and live by example but they are not family therapists. They give feedback because they have high expectations they know you can reach. 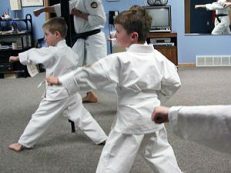 Martial arts can help a student develop discipline and self control but it does not happen by enrolling in classes. You must attend classes regularly, commit to the training and give your best effort all the time. We all have to practice to grow. Our class enrollment runs in quarters to give students a fair opportunity to try classes and find the benefits. Classes are taught by practitioners with more than 30 years of experience individually who are students first and have been teaching here for more than 20 years. 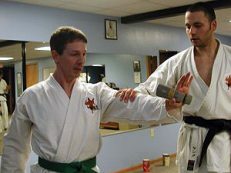 The Menomonie GoJu Ryu Karate Dojo is a 501 (c)3 Non profit educational institution focused on preserving the true essence of the traditional Okinawan Goju Ryu Karate and Matayoshi Kobudo, serving the Menomonie area since 1984. 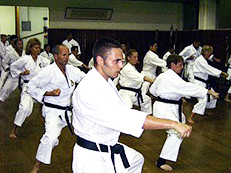 We are a traditional non-sport oriented karate dojo focusing on skill building for life! Viewings and Private lessons by appointment.